The Teacher Retirement System of Texas (TRS) Board of Trustees held meetings on June 1 and 2. 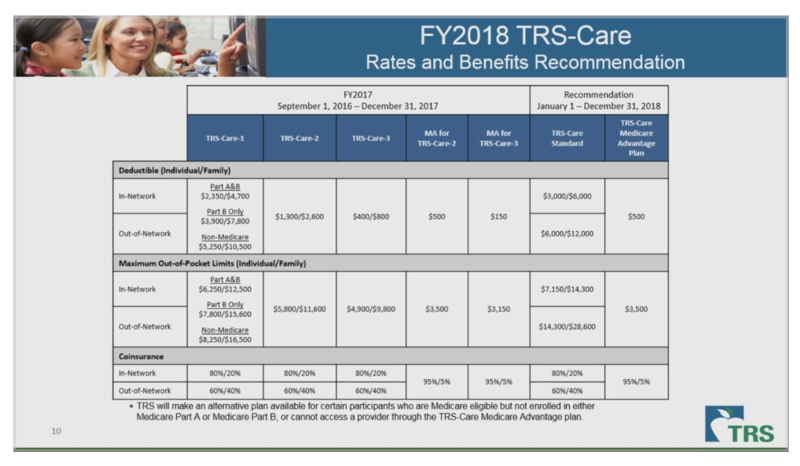 The TRS Board of Trustees finalized changes to TRS-Care’s benefit structure during the meetings as recommended by the Texas Legislature. TRS-Care, the health insurance program provided by Texas to more than 256,000 retired teachers, underwent significant funding and structural changes during the 85th Legislative Session. TRS presented this slideshow presentation during its adoption of the TRS-Care changes. Pre-65 retirees will be in a high-deductible health care plan. The deductible to reach for an individual using an in-network provider is $3,000. The plan has a $7,150 Maximum Out-of-Pocket cost (MOOP). More information about the deductible for spouses and families is listed here. Once the deductible is reached for in-network coverage, the insurance will cover 80 percent of the retiree’s expenses. The premium for pre-65 individual retirees is $200 per month. For a retiree with a spouse, the premiums are $739 per month. For a retiree with a child, the premiums are $433 per month. For a retiree with a family, the premiums are $1,074 per month. If you are age 65 or older and you decide to leave TRS-Care, you will not be able to rejoin. Carefully consider and research your health care options before making any decisions about your health care plan. Retirees who are age 65 and older will be participating in the Medicare Advantage plan. (The TRS-Care tiers 1, 2 and 3 will no longer exist.) The deductible for Medicare Advantage retirees will be $500. The plan has a $3,500 Maximum Out-of Pocket cost. 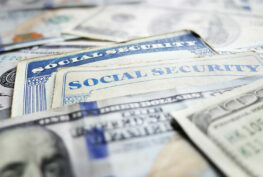 Once the deductible is reached, the insurance will cover 95 percent of the retiree’s expenses. There are other benefits to this plan, which are outlined on this slide. The premiums for individual retirees age 65 and older are $146 per month. For a retiree with a spouse, the premiums are $590 per month. For a retiree with a child, the premiums are $504 per month. For a retiree with a family, the premiums are $1,106 per month. The TRS Board of Trustees voted to change from Express Scripts as the provider of pharmacy benefits to TRS-Care programs. The new pharmacy benefit provider is CVS Caremark. This change will be effective Sept. 1, 2017 (unlike the health care plans, which begin Jan. 1, 2018). Many retirees have expressed concern that some doctors do not accept Medicare Advantage. TRS says that Humana, the Medicare Advantage provider, will pay doctors even if they are not in-network. If your doctor’s office says they do not accept Medicare Advantage, you have two options: 1) bring this document to the doctor’s office, which explains that they will receive payment. 2) have TRS or Humana contact the doctor’s office to explain that they will receive payment. 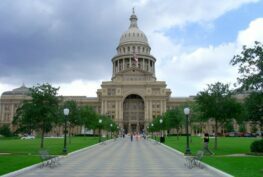 The Texas Legislature allocated $20 million for pre-65 retirees to have coverage on general maintenance drugs. TRS has not yet outlined which drugs will be included in this coverage. TRS must first work with the Internal Revenue Service (IRS) to develop this list. 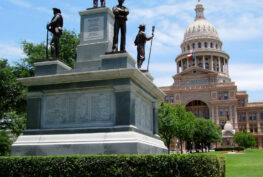 Fueled by a $1 billion budget shortfall, the Texas Legislature passed HB 3976. HB 3976 made sweeping changes to TRS-Care. 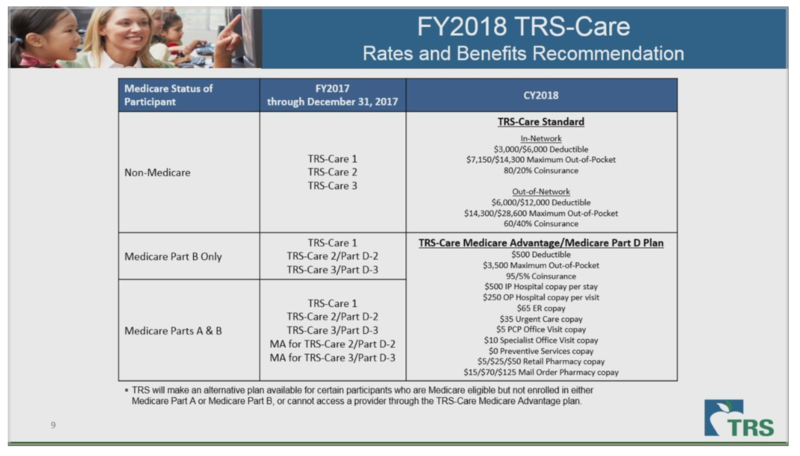 Among those changes are the elimination of the coverage tiers called TRS-Care 1, 2 and 3. Instead, pre-65 retirees will be offered a high-deductible health care plan, and retirees age 65 and over will be combined into the Medicare Advantage program. You can learn the full details about the changes from HB 3976 here. While HB 3976 has not yet been signed into law, (Gov. Greg Abbot has until June 18 to sign this bill) it is very unlikely the bill will be vetoed. On June 2, Tim Lee, the Executive Director of the Texas Retired Teachers Association (TRTA), provided public comment to the TRS Board. He described a litany of issues presented to TRTA about the pending TRS-Care changes through both individual conversations and social media interactions. In particular, Lee raised points made by retirees via TRTA’s Facebook Live events. You can watch TRTA’s past Facebook Live broadcasts here. TRS is planning approximately 80 meetings across the state with Humana. TRTA will alert its members when these meetings will occur. The Board of Trustees President, David Kelly, agreed with Lee’s sentiment that while they had hoped the Legislature would provide more funding for TRS-Care, the funding that was provided was the highest amount that the Legislature could agree on. 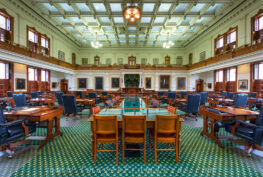 Senate Bill 1, the Texas funding bill, allocated $484 million for TRS-Care. Trustee Dr. Greg Gibson expressed his dismay at the impending TRS-Care changes. Gibson, who works as the superintendent of Schertz-Cibolo-University City ISD, said that the changes to TRS-Care would make it harder to recruit and retain talented teachers. Kelly agreed that he too had hoped for a better resolution from the legislative session, and he expressed his concern that approving these changes would create future problems for retirees. TRTA agrees with Chairman Kelly’s comments that while the situation is not the best that many had hoped for, it was the best deal that could be reached. Until the federal government implements cost controls, it will be difficult to fix the chronic underfunding of TRS-Care. TRTA believes that the federal government must take action on cost control and that the state must have a more realistic view on funding TRS-Care. While TRS is making the necessary changes as set forth by the Legislature, TRTA knows your health care is a vital part of your retirement security. The changes made this session saved TRS-Care from imminent collapse, but TRTA’s work is not done. Our goal is to be your voice in policy discussions about health care cost containment. Please support us in these efforts. We cannot accomplish these goals without your membership. Thank you for your membership to TRTA. Now is the time to spread the word about the impending TRS-Care changes with your fellow educators, both active and retired. Many retirees, particularly ones who are not members of TRTA, will be caught completely unaware by these changes. These retirees should be informed that these changes are going to begin on Jan. 1, 2018, and if they want to see a better outcome for their health care in the future, they need to get involved with TRTA and plan on voting in the 2018 elections.